Having the ability to use your gut instincts in salmon fishing plays an important role in success. That's part of the reason why I went heavy on the Dunkeld House beat's beautiful Cathedral Stream a few days ago as my gut was telling me this pool was about to come into a class of its own. This main photograph was taken from the Dunkeld Cathedral grounds and shows this perfect middle Tay salmon pool in optimal fishing condition. During lower water periods the only flight path running salmon have through the streamy water in this area directly upstream of Dunkeld Bridge is along this channel directly in front of the Cathedral lawn. The two deep troughs on the river bed of this pool offer salmon broken water pockets to hold up in with the added advantage of being able to process more oxygen in the faster stream during warmer water conditions. With the surge of Summer salmon that entered the Tay in the last few days I'm not surprised one little bit that this pool produced 3 salmon in under an hour yesterday afternoon when the ghillie finally ventured out on his own for a cast following a last minute 'call off' from 2 fishing guests who were probably self convinced themselves that the Tay was a complete waste of time! That in a nutshell is salmon fishing and another perfect example of these 'windows of opportunity' I keep referring to. On another similar occasion earlier this year a Dunkeld House beat guest called off and his last minute replacement quickly landed 2 perfect Spring salmon of 22lbs & 18lbs! From what I see the vast majority of Scottish salmon fishers are asleep right now due to the low number of salmon that were caught in the rivers this Spring and few anglers acknowledged the magnificence of the much the bigger than average Tay salmon that were caught. 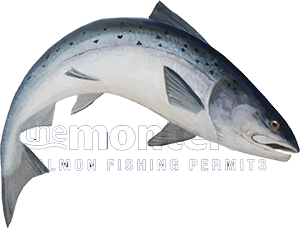 From the mainly unchanged salmon beat permit availability I observe from week to week it looks to me like many anglers aren't bothering to fish. This is undoubtedly the result of 'catch stats' brain washing that periodically cripples the industry and an underlying false narrative that salmon fishing in Scotland this year is a waste of time. On a personal basis I've never had a busier year for bookings as 95% of my clients come from international destinations and aren't 'hypnotised' by the normal brain washing factors the same way most UK salmon fisher seem to be. Like anything in life you've got to work with what you've got and when there's less anglers out trying then obviously less fish are going to be caught. In the Dunkeld House Cathedral Stream at this time the chances of catching a salmon are at least 50/50 which I'd say are great odds given the completely wild nature of an Atlantic salmon. Don't let the 'nae sayers' contaminate your drinking water and get yourself out there as many perfect Scottish salmon pools are well rested at this time which means there's a far greater chance salmon will be looking for something to chase!